10 Pounder - Caught w/Texas-Rigged Plastic Worm! I was fishing from the bank of my local park one evening and I was having pretty good success for the most part. 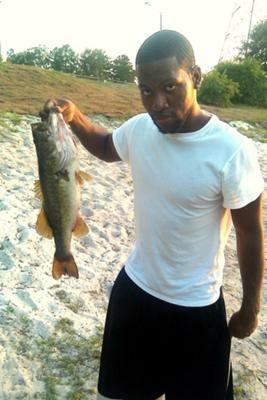 I was catching medium sized largemouth bass on the "dead sticking" method. Then on one of my last casts, I launch my bait way out into the middle of the lake. I let it sink for about 8-10 seconds and when I raised my rod tip, I seriously thought I was stuck in some algae (the lake has some pretty unruly foliage on the bottom). I start to reel in with disappointment and after a few cranks, I feel some huge tugs on the line so I jerk back and set the hook just in case. As soon as I did, that big bass went crazy! I was in pure shock. I started to reel but it seemed like it wasn't budging, so I just sat there and let him tire himself out. After about 30 seconds of pure adrenaline, I then dragged him to shore in even more disbelief. He was huge! I could barely pick him up for this photo! Definitely the biggest largemouth bass I have ever caught! Comments for 10 Pounder - Caught w/Texas-Rigged Plastic Worm! Yeah, I wouldn't say 10. Maybe 7, but definitely not 10. I would say that it looks more like around 4 pounds. It looks kinda thin, at least from the angle in the picture. In my humble opinion. 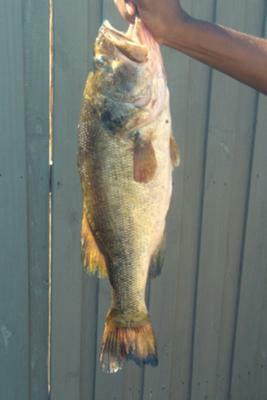 It's still a very nice largemouth bass. Good job. that is a pretty good bass. Uumm, I dont think so. I would say maybe 4 pounds there partner. I would suggest getting a fish scale, digital if possible, so you can get your weights proper. into your browser's address bar and hit enter.